Just Ask John about Dog Chews. Being able to give constructive, educational feedback to your question about Staglers Deer Antler Dog Chews make me happy. Delivering the personal service sets Staglers apart, and I am proud of this. Your Questions include: Which Chew for which breed of dog? Help, I have puppy training issues, Where’s best to stay in Dorset with your dog? Keep your questions keep coming! Because I can help, I decided to post some of them because our goal is to have happy, healthy dogs. Each month I will share some of the questions I have been answering for dog owners. ‘How can I stop my puppy chewing up the house?’ – Well, luckily, we’ve got that one covered!! Puppies love to chew, it is often an outlet for their energy, to reduce stress or simply a desire to help the new teeth come through. Our ‘Lazy Dog’ range, are specifically designed for teething dogs (or older ‘Lazy Dogs’!). 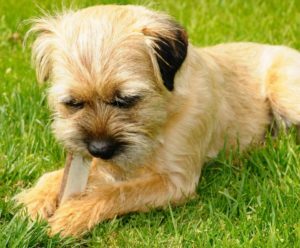 Hand cut down the middle of a ‘tube’ of antler, means that your teething pup can get at the slightly softer middle. This avoids any damage to those emerging ‘adult teeth’, and – leaves all of that lovely wood in your kitchen alone!! Our Original Range are ideal once you are happy the adult teeth are coming through, (usually around 16-18 weeks). 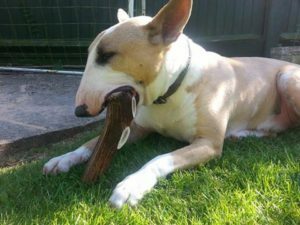 As with all chews we still advise to monitor and do not leave them with new Staglers for long periods of time. In the main, for absolute value and to last as long as possible, it makes sense to match one’s dog to the chew. The bigger more powerful breeds and ‘chewers’ need to be looking at the big chews. This may feel expensive but fortunately they still last, giving you superb value for money. Staffs, Bulldog and many of the mid to large breeds, go up a size. Rottweiler/Newfoundland/Ridgeback/English Bull Terrier etc, then perhaps start considering Jumbo, 9inch or 12inch. Believe me, they’ll struggle to make a dent on those! On the flip side I know a couple of customers who are more than happy to give their Malamute or Staffie a Small or a Lazy Dog chew. This is purely as a supervised after-dinner treat, knowing that it probably won’t last them that long, but hey, they’re worth it. Ultimately – if you’re a little unsure, then please ask. How? by our contact us page, in the notes when you place an order or give me a call 01202 631734. I’ve got many years’ experience and are more than happy to answer any queries, most of which will have been asked in the past. Which size antler chew would you recommend for a Siberian Husky? Hi, I have a Bernese Mountain Dog who is a very aggressive chewer. Recently online I bought a ‘jumbo’ deer antler (red deer) which was around 10 inches long and it lasted her less than a week, even though I only gave her it for short periods.. Antlers are the only thing/toy/chew I can give her as she shreds anything else straight away. I’m looking for a regular supply of extra large, round (not flat as she chips those) dark-coloured, robust antlers for her, rather than have to always be trawling the internet. I would like them to be cast naturally, washed in nothing but pure water and chunky as well as long. I paid £25 (inc postage) for the last one. If I buy from you regularly, could you supply them at a more affordable price ? Thank you so much for contacting us Elizabeth. Wow your beautiful dog has done a proper demolishing job on the Jumbo! You obviously did the right thing regarding giving the antler to her. Our antlers are cast naturally and meet your other needs. We will give you a call to discuss which chew will best meet the needs of you, your budget and your dog. I have a large rather overweight Corgi who is on a very strict obesity diet at the moment,and not allowed any treats, Would giving him a Stagler chew impair his diet ? He is nine years old,and I have noticed just lately that his breath does smell sometimes. The Vet tells me that his teeth are perfect. I would dearly love to give him some form of treat, but am nervous about anything that would maybe increase his weight again. He has become very special to me since my husband died . Thank you so much for contacting us Jackie. We are pleased to hear you are giving your Corgi every opportunity to be healthy and ultimately slimmer! Staglers are natural and non fat, giving him the benefits of cleaning those teeth naturally, whilst giving negligible calories. We are confident Staglers will not impair his diet. If you have any more questions please ask but we are sure he will love his allowed treat.